Beautiful Thing – Inside the Secret World of Bombay’s Dance Bars by Sonia Faleiro is a remarkable documentary account of a few years in the life of Leela, a dancer in a Mumbai dance bar, her friends, her clients and her co-workers. It’s a life set on the wrong side of the tracks which reveals the power of friendship, honour and companionship that belies the sordid surroundings. Even more remarkable is the friendship between Leela and the writer which offers Faleiro an opportunity to go where few writers would be able to and at considerable risk to her own health and personal safety. I’ve long been aware of the shady world of the Mumbai dance bars because I was in Mumbai in 2005 on a business trip at the time of the crackdown which is described in the book. The local papers were full of the news of the closure of the dance bars and I asked a local colleague what it was all about. He blushed and, being a respectable Kerala Christian, explained to me that they were bars where men go to have a few drinks and watch ladies dancing but that they were not strip joints or pole-dancing places (in so much as he had any idea what those were like either). The bars had been accused of encouraging immorality and a local politician had sent in the police to shut them down. I was fascinated but didn’t like to push him further – so when I heard that a book had been written about the dance bar world, I wanted to read it to fill the gaps in the Swiss-cheese of my knowledge. They say you should never judge a book by its cover but when that cover carries endorsements by William Dalrymple, Kiran Desai and Gregory David Roberts, Indiaphiles will realise that this is something very special and readers should sit up and take notice. I’ve read a lot of non-fiction about India recently and whilst it’s almost always interesting, some of the books can be heavy going. The only hard thing about Beautiful Thing will be putting it down once you’ve started. For a difficult story, it’s a remarkably easy read that flows like a novel rather than non-fiction. Sitting on our western perches, the image we have of women in India is usually that there’s little more important in life than a girl’s virginity and the drive of her parents to make a good marriage. What ‘Beautiful Thing’ shows us is that Indian life isn’t all about virginity, dowry and respectability. Leela’s father took her virginity when she was still a child before later sharing her with other men in the family. Faced with such a life, she ran away to the city. It’s no wonder we learn she’s a hard, coldly-calculating woman who knows her own value and how to exploit her ‘kustomers’. She calls her boss at the dance bar her ‘husband’ and is monogamous in turning a blind eye to his relationship with his wife. By contrast the parents of her even more beautiful friend and fellow dancer Priya valued her virginity highly – so much so that they sold it to the highest bidder for a considerable sum of money, thus ruining any chance of a good marriage but pocketing a lot of money and saving themselves the trouble of a dowry. Is it any wonder that dressing in pretty clothes and performing Bollywood dance routines for a bunch of men paying over the odds for drinks must have seemed like a sanctuary? When the clubs were closed down and the girls lost their relative safety and security, it doesn’t take long for their lives to turn considerably more dangerous and sordid. We learn that life in the dance bars gives the most beautiful and popular girls a wealth that’s beyond the dreams of the prostitutes out in the slums and a relative respectability that enables them to be courted by clients who spoil them rotten in return (initially) for little more than a bit of flirting and hand holding. A girl can exploit a lovesick married man who’s never known beauty and exoticism in his sedate arranged marriage every bit as much as she herself is being exploited. There’s nothing modern about these arrangements – India has a long history of courtesan-ship – women providing entertainment and romantic distraction for men with money. Dancing girls are dancing girls – regardless of the time in history and the story is thus simultaneously very modern and somewhat timeless. The money brings the girls little benefit though because they can only live in certain areas of the city where the neighbours will accept their career choices and they spend like crazy. One might suppose they’d earn to send money back to their families – until you remember what those families did to drive them to the city. Priya has a legal husband, a man she loves who bleeds her dry and cheats on her with other dance bar girls, impressed by how far one girl will go to self-mutilate as testimony to her love. On the other hand, when the looks start to fade and the reliance on cheap drugs to keep them slender takes away their looks, there’s only one direction the girls will be heading and that’s downhill towards running or working in the brothels. The top girls dream of an assignment in the Middle East, of being sent to Dubai to dance for wealthy Arabs and take on the status of ‘temporary wife’ which allows their clients to stay within the letter, if not the spirit, of Sharia Law. Beautiful Thing is not entirely and unrelentingly miserable. There are moments – few and far between – when the story lifts your spirits. There’s the story of one of Leela’s friends, a hijra (transsexual) whose parents realised their only way to keep the son they love is to accept his choices. He and his family seem to represent the only family in the book who are not utterly dysfunctional. The bar dancers and the less fortunate hijras take great comfort from this tiny evidence that family relationships can work and love can conquer even the most extreme of life choices. The book is an eye-opener of the most fascinating type – a rare and privileged opportunity to take a tour of not just the demi-monde of Mumbai but, after the bars close down and times get hard, the real hard graft of the unsafe streets and brothels of the city. I am absolutely awestruck by the research that went into this book which is Sonia Faleiro’s first. To throw yourself into the underworld, court the friendship of fascinating but dangerous people, follow them wherever they go without apparent concern for your safety, and to do all that as a young woman from out of town, is nothing short of remarkable. Even more so, to do it by choice. Hats off to Faleiro – she’s an astonishingly brave woman. I really hope that we don’t have to wait five years for her next book. I fear that the market for non-fiction of this type outside India is surely rather small and the use of a lot of local language (often but not always) translated or explained, will alienate many readers, but I hope that enough will accept that it’s a small price to pay for a book that’s truly one of a kind. With thanks to Canongate for providing a review copy. 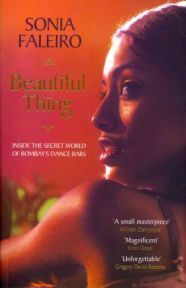 One Comment on "Beautiful Thing – Inside the Secret World of Bombay’s Dance Bars"
This sounds fascinating – I’m not normally that attracted to books about India but this sounds worth a read.